Right now I am LOVING lipsticks - I actually cannot get enough. Well I've always loved lipsticks but the amount I have bought over the last couple of months is both staggering and worrying! I don't think I will ever have too many in my collection! A colour that keeps appearing in my "most used" is one I'd never really worn until this year and that is.... purple. 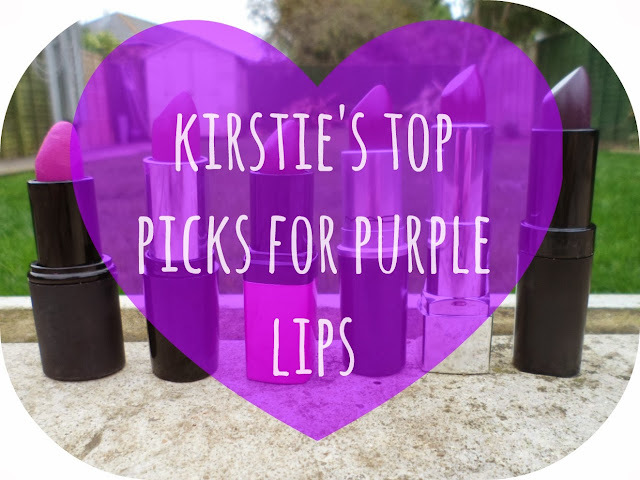 I am loving purple shades, from bright funky violets to deep sultry purples, I have found them to be some of my most reached for at the moment! 5. Rimmel Moisture Renew - Dark Night Waterl-oops! 1. Sleek True Colour - Mystic : If you've read my blog recently you may have seen my blog post on this lipstick! I bought it on a trip to London back in September and have been wearing it ALOT. It is a gorgeous bright violet purple and for more pictures check out my post on it here. 2. 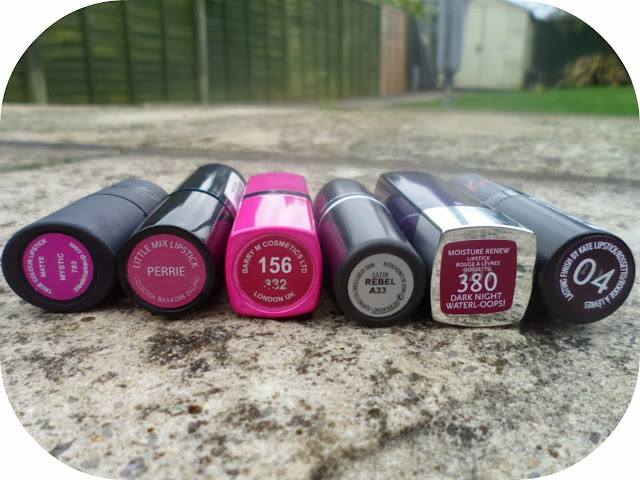 Collection Little Mix - Perrie : Now I was after this lipstick for weeks and weeks, my local Superdrug doesn't stock the LM Collection and it was sold out online *big sad face* - but when I spotted it last week back in stock on the Superdrug website - that was it, mine! I'm so pleased I managed to get hold of it aswell as I love it, a total bargain at only £2.99, I'm so impressed. I wore it last weekend to my best friend's wedding party and it stayed on so so well - check out a photo here! 4. MAC - Rebel : I've been eyeing this beauty up for months and finally decided to splash out the £15 for it! So many of you will be owners Rebel and I know why - this is so easy to wear and being a MAC lipstick the forumla is gorgeous! I love their lipsticks so much... I just wish I could afford more of them! I highly recommend it! 5. Rimmel Moisture Renew - Dark Night Waterl-oops! : This was mentioned in my October Favourites post - the new Rimmel Moisture Renew lipsticks are incredible! They are so thick and pigmented - the swatch above was just one light swipe of this beauty, they are flawless! I cannot wait to buy more of them! 6. Rimmel Kate Moss - 04 : I have some good news and some bad news about this one - Bad news....I believe it has been discontinued BUT good news I purchased it from Fragrance Direct and it was only £1.99!! Absolute Barry Bargain! The Kate Moss lipsticks are amazing, if you own any of them you will know how great they are, I can't believe this one isn't available anymore - it is a tragedy! If you are looking for a really dark dark purple - this is the one for you! 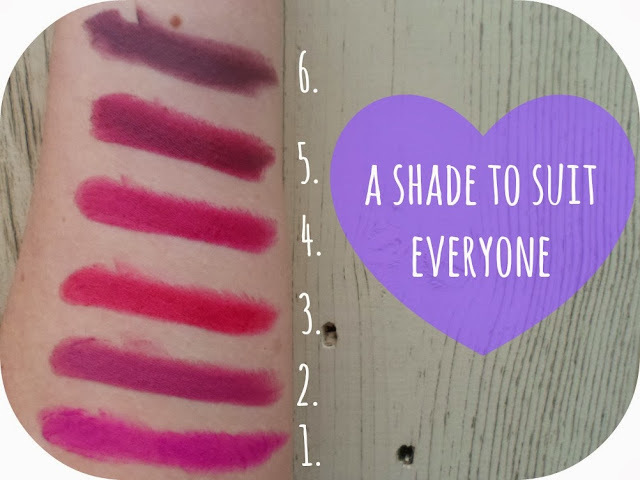 Have you tried any of these purples? Have you got any shades you recommend? I have the Perrie lipstick - I'm not a mega fan of Little Mix at all, but this colour was too nice to not buy! I love it! I love the Rimmel Moisture Renew one best - may even have to run out and get it tomorrow! Love this post! I can't believe Rimmel discontinued that gorgeous purple shade :o luckily people can still nab it at a discounted price. 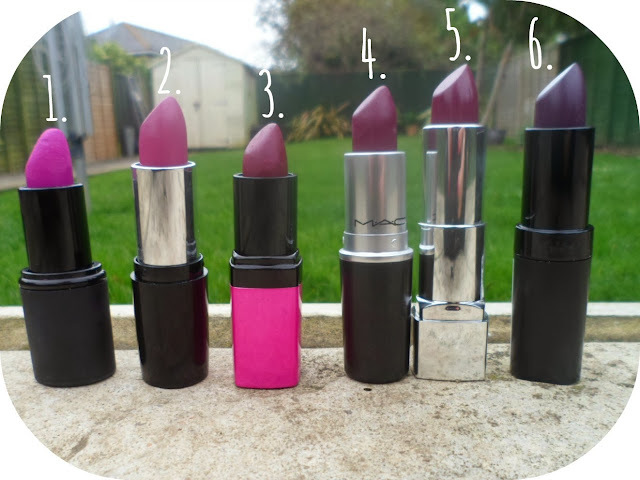 I love love love purple lipstick so thanks for this post! me too! you are welcome! I'm not sure I could pull off a purple, but these all look gorgeous. The MAC one is gorgeous but I'm too scared to try such bold colours haha!